Bright sun peeked through mist and bare trees just after 10 a.m. on a late February day as the first hints of record warmth boldly unleashed an early spring. For two groups of students – one made up of 20 fifth-graders from Aurora’s Krug Elementary School, the other composed of 10 Physical Education majors from the NIU College of Education – the appointment with nature couldn’t have come at a better time. Within a few hours, the skies gave way to flawless blue while the mercury soared past 70 degrees. Birds chirped. Chainsaws growled. Neither a snowflake nor a chilly wind – usually facts of life in a Midwestern February – could be found. This trip to NIU’s Lorado Taft Field Campus, an outdoor education center located within Lowden State Park in Oregon, Ill., truly offered the perfect conditions for teaching and learning for young children and young adults alike. fifth-grader Yvonne Chanda learn how to start a fire. As future P.E. teachers, Koehling says, the students are adding a priceless distinction to their resumes. Nick Wiltsie helps fifth-grader Angelina Sifuentes with her compass. “Coming out here, you’re testing more than content knowledge,” adds classmate Nick Wiltsie, a senior P.E. major from Elgin. 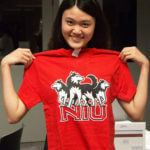 NIU’s students made an initial visit to Taft about 20 days earlier, during Super Bowl weekend, when they took on the roles of the fifth-graders. Guided by Taft’s professional and enthusiastic staff, the future P.E. teachers explored the beautiful woods while they learned about orienteering, pioneering, birding, forest ecology, survival and Native Americans. They took night hikes through the darkness, played outside games and performed campfire skits about nature. Most importantly, though, they saw the outdoor education modeled for them while they planned their own delivery of those same lessons. After whooping up a rousing welcome for the fifth-graders, the Huskies quickly escorted the boys and girls and their backpacks to the cabins for bunk selection and unpacking. Kelly Miotti works with Angelina Sifuentes. Formal introductions followed – the P.E. majors gave their names, revealed their favorite colors and ice cream flavors and demonstrated their favorite dance moves – as did theatrical presentations of the basic rules: Be on time. Dress for the weather. Respect property, others, nature and yourself. Walk. Stay with an adult. Quick tours of the grounds led to the dining hall, where the campers and their temporary teachers shared lunch, their first of seven meals together. By 1 p.m., the real outdoor education had begun. Miotti, Wiltsie and fellow P.E. major Brandon Palmer marched their quintet of fifth-graders to a large field. 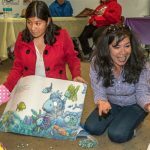 They opened their lesson on Native Americans with a poll of the favorite family activities of the children – answers included charades, hide and seek, Uno and dancing – and questions about what the children learned from those things. “Just like you play games with your family, the Native Americans also played games,” Palmer told the group. And, he added, they learned and sharpened hunting skills amid the fun time of bonding. Dusk falls over the Rock River at Lorado Taft. The children then were taught a different way to play tag, one where the tap had to come behind the knee. A player tagged could remain in the game by hopping around on the untagged leg; if that hopping leg also was touched the player still wasn’t “out,” but had to sit on the grass. After a few rounds, the NIU students asked their campers what they had learned about hunting from playing the game. Be agile, quick and strategic. Stay low. Keep your hands out. Swivel. Face the other players. Don’t let your opponents strike from behind. Questions about hunting continued with Fox Walking, a game where one child was blindfolded while her classmates tried to sneak up and steal a stick placed at her feet. The child without sight had to rely on other senses to point in the direction of the would-be stick-stealer. What senses do the prey use? What are some ways that foxes creep up without being detected? How can being slow, steady and quiet apply to rummaging for food? How can we think like a fox? Krug children also hurled spears and sticks at empty laundry soap jugs standing in for animals – What were some of the struggles you had while throwing? – and then worked to make fire by rubbing rope against wood. No matter their effort and sweat, unfortunately, the labor produced little more than some warmth in the stick. Just think, Palmer told the children: Native Americans needed to make fire in this way every time they wanted to cook food or to stay warm – and imagine how lucky we are to simply flip switches. Lessons in using a compass came next. Children received a crash course in moving the housing and reading the needle before walking around the field in directions dictated in degrees. Later, they worked in groups to tromp through dense woods in search of orange-and-white posts that would disclose the bearings to the next checkpoint. Success wasn’t easy; many footsteps were retraced and then retried after the compasses weren’t set properly. “I just kept motivating them,” Miotti says. and Bella Davila try to make fire with rope and stick. NIU’s course in outdoor education, designed and originally taught by Jenny Parker, an associate professor of P.E. teacher education and now NIU’s acting associate vice provost for Educator Licensure and Preparation, prepares students to teach independently and in teams. They get the chance to teach curriculum typically not found in the gym, including history and science, along with experience in chaperoning field trips. “Peaks and Pits” debriefing sessions each afternoon allow them to swap stories of what went right and what could improve with change. It’s important for these almost-teachers to make each other look “golden” in front of the fifth-graders, Koehling says, and it’s already working. For Koehling, who fell in love with this outdoor education course years ago when Parker invited her to Taft to watch for a day, these professional conversations among her students are a joy. She’s also a passionate participant in the Taft experience. 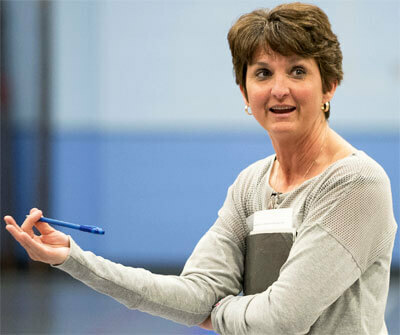 During the early February weekend, she taught her students the nighttime “Alpha Wolf” game, a non-aquatic version of Marco Polo with howling and jump ropes. No need to keep eyes closed in the pitch-black darkness of a state park. 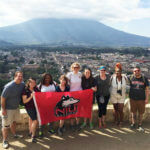 Not surprisingly, Koehling hopes to see the outdoor education course expand beyond KNPE to other NIU teacher licensure programs. She also hopes to bring KNPE 200 students to Taft for team-building exercises. Meanwhile, her students are enjoying independence in their teaching for perhaps the first time. They’re being pushed out of their comfort zone, and they’re growing in their confidence and abilities with every happy exclamation from the fifth-graders. Wooden stairs meander along a Lorado Taft hill. Wiltsie, who spent four years in the U.S. Army Reserves during his time at NIU, understands. He wants to teach younger generations to become lifelong learners who are physically active while making the most of the gifts and skills they possess.